Born without spots, a little ladybug discovers that being different can be a good thing. A delightful interactive book app that shows how being different makes you special. 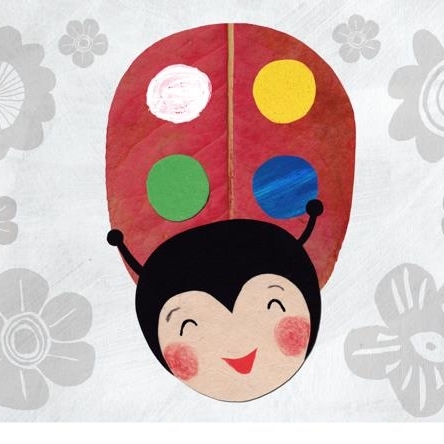 Lucy Ladybird is a colorful and gentle story that focuses on Lucy, a red ladybug that was born without spots. 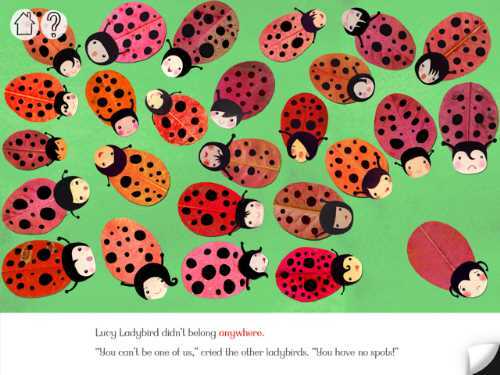 Ostracized by the other black-spotted ladybugs for being different, Lucy leaves her community because she feels inadequate. Lucy’s journey has her flying through the four seasons; and in each she meets a friend who accepts her for what she is and appreciates things about her that are special. 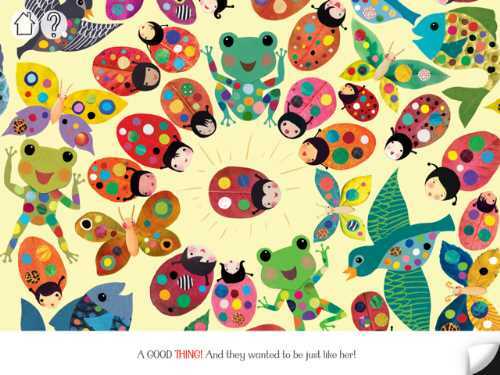 Those friends – a frog, a caterpillar, a fish, and a bird – all have spots of their own, and each decides to give a colored spot to Lucy in hopes of cheering her up. By the time a year has passed, Lucy decides to return home, wearing her four colored spots. The other ladybugs now admire Lucy for being different. In its 23 pages, Lucy Ladybird presents a strong message about the importance of diversity. 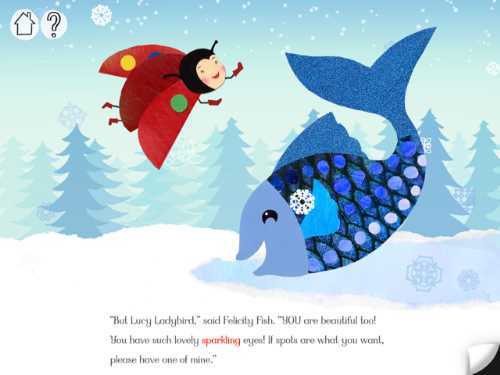 By setting its important message about accepting others and ourselves within a charming story about a ladybug who looks different, this book app can reach even the youngest listener. 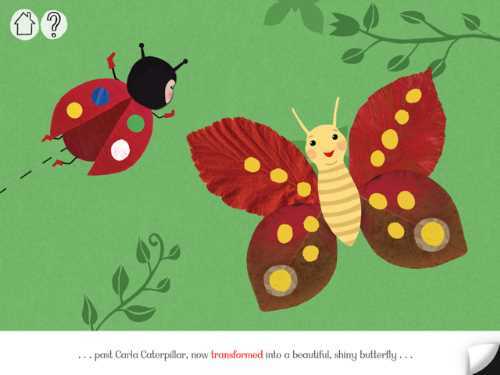 The book app uses bright, collage illustrations, which are reminiscent of Eric Carle’s work, to introduce young kids to the seasons of the year and the changes in nature that occur. When readers meet the caterpillar in the fall, he is riding a bike. But when they see him again in the summer, he has changed into a butterfly. The book also introduces counting to four and the different colors. On each page there is some interactivity, but the main focus is the emotional growth of Lucy. Parents can get clues about the hidden hotspots by touching the "?" icon in the top left corner of each page. Kids will tap on a spot from a friend to help it fly over to Lucy's wings. The most magical interaction occurs on the pages where touching empty tree branches results in colorful flowers growing. After the book ends, there is a page of promotion for the app developer that is not under a parental gate. It leads kids to social media and the internet. We hope the app developer will add parental gating to this page, since it is inappropriate to take kids to Twitter, Facebook, and the developer's store. Lucy Ladybird is a great book app to explore with all children because it teaches tolerance. It's a good book app to introduce when your children’s feelings are hurt or when they feel like they don’t belong. if you have a musical learner, the book has a great sing-along that retells the story. It can be a catalyst for talking with your kids about being different, sharing, and accepting others. For more apps that focus on emotions, check out our rec list called Best Apps to Teach Kids about Emotions. 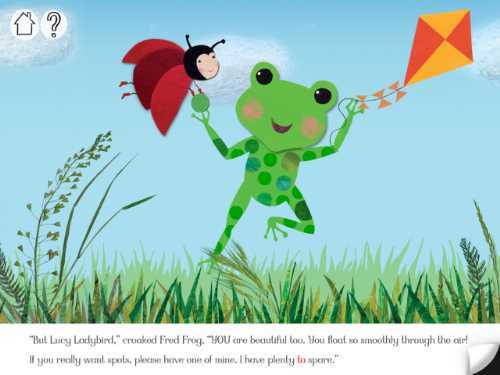 Jinny Gudmundsen wrote this kids' app review of Lucy Ladybird.